Looking back, it seems odd that in 1952 DC would rather take a chance on an unknown canine adventure series than give a new title to an established superhero like Green Arrow or Aquaman. Those heroes had been toiling away as back-up features in various magazines for a decade, but the powers-that-be decided instead to go with newcomer Rex the Wonder Dog. 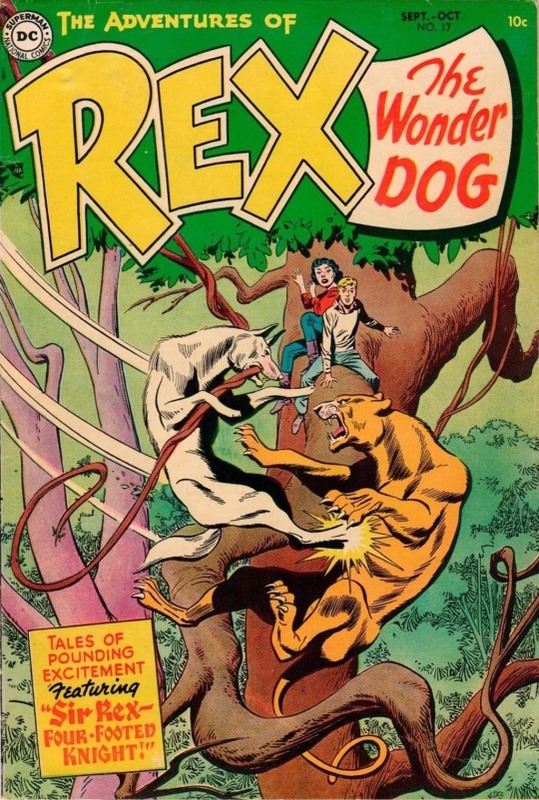 Created by writer Robert Kanigher and artist Alex Toth, The Adventures of Rex the Wonder Dog ran for 7 years. Rex was a veteran of the army’s K-9 unit—a hero awarded a medallion for bravery. When his master goes missing in action, a Major Dennis adopts the dog and brings him home to take care of his family while he is away on special duty. Usually accompanied by Maj. Dennis’s young son Danny, Rex would be a magnet for adventure—solving all sorts of crimes, assisting during natural disasters, as well as becoming a movie and circus star. 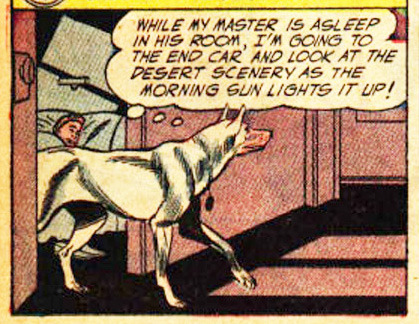 That’s a lot to accomplish for a dog who technically had no super powers—although he would often use his highly-trained nose to pick up on “the scent of evil”. The creative team that worked on this book would go on to be Silver Age royalty. Kanigher wrote Wonder Woman for 20 years beginning in 1948. Gil Kane, who replaced Toth after the second issue, would become known for his work on the Silver Age versions of Green Lantern and The Atom. In addition, the team behind Rex’s supporting feature, Detective Chimp(! ), were also noteworthy Silver Age contributors. Artist Carmine Infantino co-created the updated version of The Flash and drew the feature for its first nine years. Writer John Broome, along with penciler Kane and editor-conceptualist Julius Schwartz, created Hal Jordan, the Silver Age Green Lantern. He was also the primary scripter for The Flash and Green Lantern throughout the 1960s. And if you were a kid in 1954, I hope you didn’t buy this comic because you were intrigued by the cover. Nothing even remotely similar happens in this issue. 1. Sir Rex – Four-Footed Knight! This is a crazy story but also one I can imagine appealed to kids in 1954. Not only do Danny and Rex survive a plane crash, but they are also somehow transported back in time to medieval Britain, which they find ruled by a tyrant. Merlin the Magician himself has predicted that Rex would come to help overthrow the evil ruler—and he does. On top of all of his other skills, Rex also fulfills prophecies! Only slightly less impressive is Rex riding a horse and jousting with knights. 2. The Case of the Suspicious Signature! Bobo, the chimpanzee deputy to Sheriff Chase of Oscaloosa County, Florida, has a new hobby—collecting autographs. (Nothing in that sentence sounds odd to me—how about you?) When they get a call from the manager at the Torquemada Auto Court, Bobo recognizes kidnapped movie star Wallace Brook’s handwriting in the motel register. That’s the only clue the monkey needs to rescue Brook and capture the kidnappers. 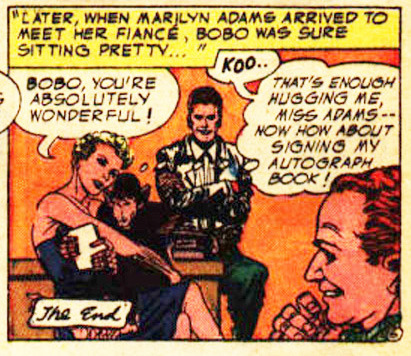 What Bobo really wants though is the signature of Brook’s glamorous fiancé, Marilyn Adams. 3. The Secret of the Scorching Sands! Danny and his Wonder Dog are traveling by train to Los Angeles where Rex is to receive a special award. Rex gets up early in order to see the desert scenery at dawn but is accidentally thrown off the train without anyone’s knowledge. 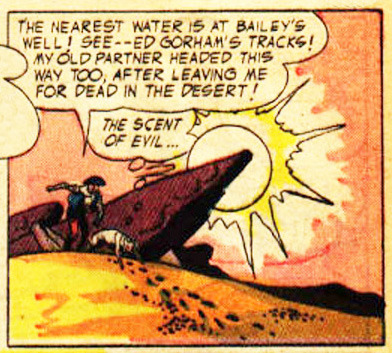 Wandering alone in the desert, he comes across an unconscious gold prospector and saves him from a poisonous lizard. He accompanies the prospector as they look for water and saves him once again—this time from the prospector’s gun-toting double-crossing partner. Once the prospector’s ex-partner is in jail, Rex hitchhikes to LA to be reunited with Danny. I’m not really sure which is more remarkable—that Rex can hitchhike, or that he has an appreciation for a scenic sunrise.